Apple has released iOS 11.2 beta 6 to users enrolled in the iOS beta testing program, along with macOS High Sierra 10.13.2 beta 6 for Mac users who are beta testing the latest Mac operating system. The new iOS beta release continues to refine iOS 11.2 as it focuses on bug fixes and feature enhancements. iOS 11.2 is also expected to include support for ApplePay Cash, a new feature which allows iMessage users to send cash payments back and forth to one another through the Messages app on their iOS devices. Beta 6 of macOS High Sierra 10.13.2 presumably focuses on bug fixes and enhancements to the Mac operating system as well. Though uncertain, the new beta build likely includes a patch for the root login bug and file sharing issue that were later patched for macOS 10.13.1 and 10.13.0, and obviously will be patched going forward. 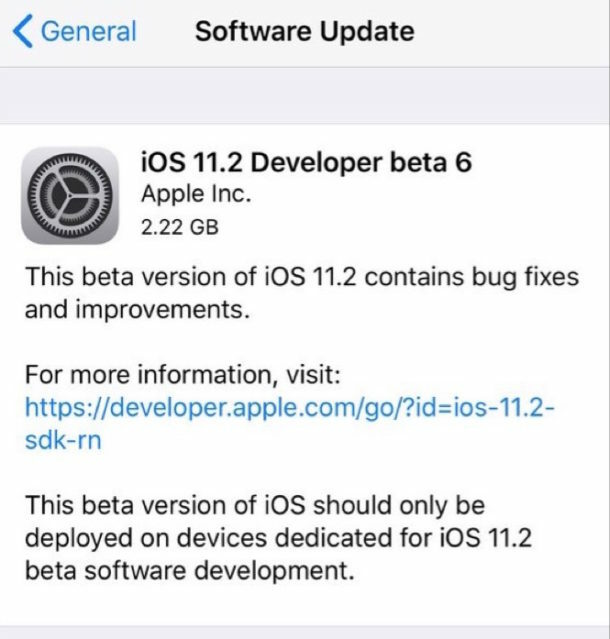 iOS beta users can find the latest update of iOS 11.2 beta 6 available to download now via the Settings app “Software Update” section. Mac beta testers can find macOS High Sierra 10.13.2 beta 6 to download from the Mac App Store Updates section. Typically the beta builds arrive for developers first, and public beta testers soon after. Apple usually runs through several beta versions of operating systems before releasing a final version to the public, perhaps suggesting a final build of iOS 11.2 and macOS High Sierra 10.13.2 could arrive in the coming weeks. From my testing, this update fixes the Root problem. What did Apple add (without informing users) in iOS 11 that has caused iPhones 6 and 6S to become slower? That thing needs to be removed ASAP. That’s correct, it is MacOS 10.13.2. The final version is now available.